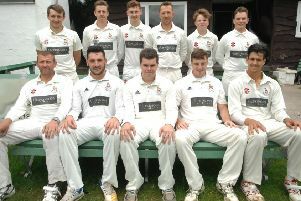 Reigning Airedale & Wharfedale Senior Cricket League champions Beckwithshaw could be relegated from the top-flight this weekend, less than 12 months after winning the 2017 title. Having suffered the departure of influential captain Alex Lilley and a number of other key members of last season's squad, the Killinghall Road outfit have struggled this term and Saturday's derby defeat at Follifoot leaves them 49 points adrift of safety. Opener Dax Guy's knock of 29 was the best that any of the 'Shaw batsmen could manage and Paul Angove (3-3) and Yasar Ali (3-32) helped get rid of the visitors with only 129 to their name. Matthew Williams (52 not out) then steered Follifoot to an easy victory, the hosts requiring only 15.1 overs to reach 130/3. 'Shaw now desperately need to beat title-chasing Otley in their next game to keep their slim chances of survival alive. Elsewhere in Division One, Bilton secured a seventh success of the campaign, getting the better of Horsforth by a 78-run margin. A half-century from Lewis Mallinson (52) and Siraj Hussain's score of 46 helped Ryan Bradshaw's side post 186 all out. Some superb bowling by Mustahsan Ali Shah (5-33) then went a long way to dismissing Horsforth well short of their target. Amir Hussain also impressed with the ball for Bilton, finishing up with a return of 3-21. Collingham & Linton are in a position to wrap up the Division Two title next time out having chalked up a seventh successive win when they sank Saltaire. 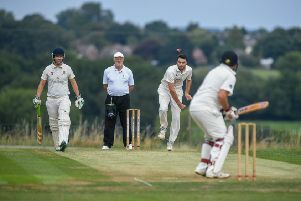 The hosts' usually-reliable top order for once failed to fire, but from a position of some peril at 137/7, an unbroken stand of 195 between Steve James (70 not out from just 46 deliveries) and Adam Wetherall (40 not out) guided them to 242/7. Saltaire slumped to 38/5 in response and never looked likely to complete their chase, eventually being sent back to the pavilion on 121. Toby Jacklin and Charlie Swallow each effected a trio of dismissals for Collingham, who have opened up a 36-point advantage at the summit. Bardsey were another side to take a step closer to sealing top spot, seeing off Old Leodiensians in Division Three. The hosts compiled a total of 181/4 batting first at The Crag, however Mohammed Altaf (69 not out) led the league leaders to a four-wicket triumph.